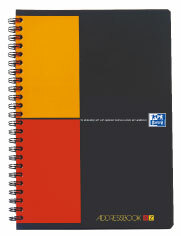 The Oxford Addressbook is made to last thanks to the polypro cover and twin wire binding. This allows each page to lie flat for easy entries and viewing. In addition every page has two color ruling for simplified reference. Boxes are reserved for email, office number, direct fax, mobile/cell and home telephone numbers. Alphabetized plastic laminated indexes provide efficiency. Each book holds 974 addresses and includes 28 self adhesive labels for easy, neat updates. Just peel off the label and place it over a previous entry. In addition each book includes two pockets for storing business cards, receipts etc. The inside front cover has international information such as calling codes and world time zones. As with all Oxford products 80gsm fountain pen friendly paper is used for quality and lighter weight. Manufactured in France and Denmark.